The De Arend (The Eagle) was built in 1839 by Longridge & Co, Bedlington, for the first Dutch railway line, running from Haarlem to Amsterdam 2). This locomotive is reputed to be the first locomotive in the Netherlands but historically this is not quite correct. Sister engine De Snelheid (The Velocity) was the first to arrive and run tests in the Netherlands, but it was De Arend that pulled the inaugural train together with De Snelheid. In the early years of railways technology obsolescence was a greater phenomenon than wear. 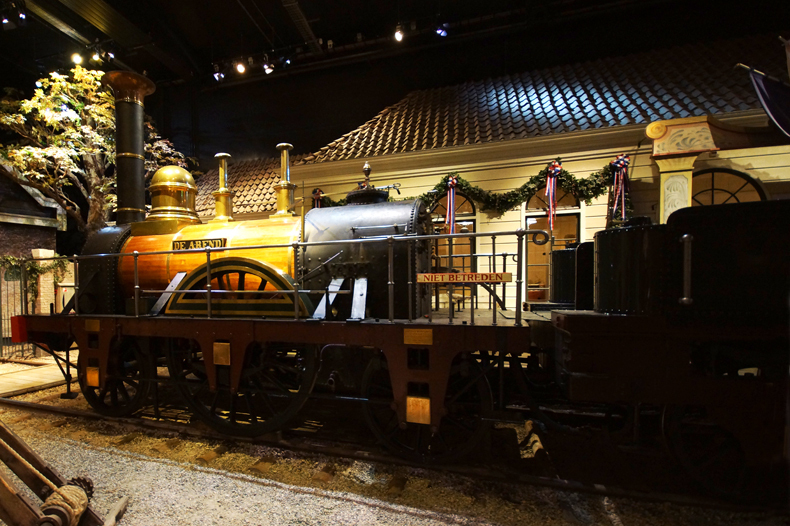 By 1851, just over ten years of service the locomotive was completely refurbished but progress overtook. By 1857 the engine was deemed obsolete and swapped for a more modern engine coming from the NRS 3) and subsequently scrapped. There are no known photos of the locomotive. 2) This line was layed in broad gauge, 2000 mm centre rail to centre rail. Later it was realised that measuring this way would mean that the gauge changed every time the size of the rail changed so the common practise to express the gauge measuring from inside rail to inside rail was adopted, resulting in the odd 1945 mm gauge. 3) Nederlandsche Rhijnspoorweg maatschappij, Dutch Rhine Railway Company. Originally constructed in the same broad gauge as the HIJSM realisation soon dawned that there would be no viable future for the traffic to Germany if the broad gauge would be adhered to. NRS accepted the costly error and reconstructed the lines in 1855 after only ten years of broad gauge. Older locomotives were obsolete and many of them found their way to the HIJSM, the NRS Vesuvius replacing the De Arend. HIJSM drew the same conclusion some years later and by 1866 the braod gauge era in the Netherland had ended. The model comes from a set which was issued by the Dutch railways in 1989 on the occasion of the 150 year of railways celebrations. It is a rather simple plastic model but all in all it is a reasonable presentation in 1:87. Moreover it is correctly spaced for broad gauge! The original set came complete with three cars and a display case. I have the three cars but not the display case. A display case in good condition is extremely rare as the transparent plastic turned brownish and brittle over time.